HBO’s new film, The Gathering Storm, takes its title from the first volume of the history of the war that Churchill wrote. 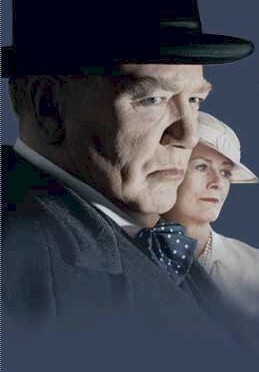 The fictionalized screenplay by Hugh Whitemore (Utz, Jane Eyre) is a character study of Churchill (Albert Finney) and his relationship with his wife Clementine (Vanessa Redgrave) during the lull in Churchill’s career in the late 1930’s. Of course, Whitemore also draws on the history of the time, much of it delivered through the dialogue, which is compromised in a few instances by the nonconversational tone of a history lecture. But considering the complexity of the story told, those moments are sufficiently rare that they do not significantly hamper the proceedings. The political plotline focuses on the conflict between Churchill’s outspoken and initially unpopular views on the threat of the Hitler regime in Germany, and the preferred policy of Prime Minister Stanley Baldwin’s government to bury their heads in the sand as Germany rebuilds its air force and rearms, even while pursuing policies of "racial purity." The factual data that Churchill needs to make his case is provided surreptitiously by a sympathetic high ranking bureaucrat in the Foreign Office (Linus Roache) who puts his career at risk by passing on classified information. On the home scene, wife "Clemmie"is tested by Churchill’s spendthrift ways, learning from their accountant that they are near bankruptcy. Churchill is imperious, impatient, and implacable; Clemmie encourages him to continue in his work because she "could not survive his bad temper in retirement." When she decides she needs a break and tells him she is going with friends on a four month journey to the Philippines, he accuses her of being selfish. His own clumsiness earns him the worst: she recoils violently, goes off anyway, and presumably has an affair. There’s a great deal of telling detail in the film. Churchill suffered from clinical depression for which, at a time when it was still called "melancholia," there were no pills for quick relief. Churchill’s painting was one of his ways of fighting it off and he even did bricklaying as a therapy. (The filmmakers had access to the Churchill estate, Chartwell, a location which itself almost becomes a character in the story.) He loved the house for its view of the English countryside which he called a "ravishing landscape." He dreamed of his ancestor, the Duke of Marlborough, who led a coalition of European nations against the French.at the beginning of the 18th century; that he saw his rise to leadership as Destiny seems at once audacious and fully understandable. The Gathering Storm operates in Masterpiece Theatre territory–with the same intelligence, literacy, and high production values expected in that other venue. HBO enhances that with a lavishly cast production. Albert Finney is hands down for an Emmy for his portrayal of Churchill. Aside from capturing the essence of voice and carriage, he inhabits the persona of this brilliant and principled statesman, convincing in his public power, sympathetic in his private weaknesses. Redgrave seems incapable these days of giving a bad performance. Her Clementine doesn’t get as much to do as might be hopedfor, but this actress doesn’t even need lines; her facial expressions and body language speak volumes. Linus Roach (Pandaemonium, Hart’s War) stands out as Churchill’s mole, sensitive, troubled, and brave. As his wife, Lena Headey is charming and gives a performance in marked contrast to her equally fine, but very different work in Aberdeen. The depth of casting has Sir Derek Jacobi, Jim Broadbent, and Hugh Bonneville all in supporting roles.